The public is welcome to participate in 50th anniversary events. A celebration to mark the 50th anniversary of the Hawai‘i State Capitol is planned for this month with the public invited to tour the building and attend a free series of sessions on the history and design of the Capitol, legislative milestones and the future of civic engagement. 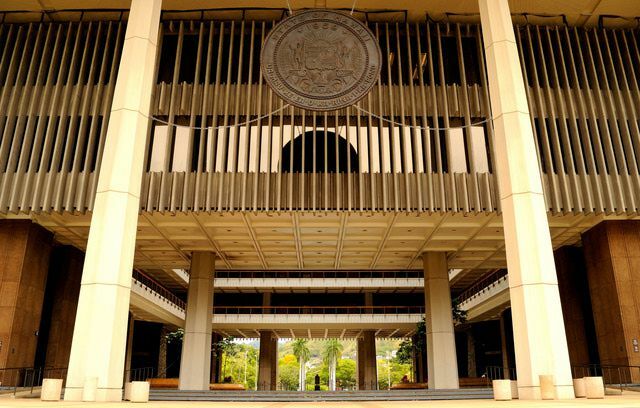 “Democracy by Design: The Hawai‘i State Capitol at 50” activities will include a 10 a.m. ceremony in the rotunda on Friday, March 15 with remarks by Governor Ige, Senate President Ron Kouchi, House Speaker Scott Saiki and 50th anniversary task force chair Sen. Brian Taniguchi. The community is invited to do self-guided tours of the Capitol and view exhibits. 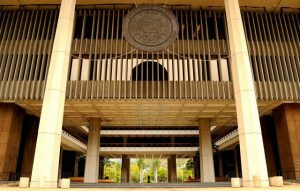 On Saturday, March 16, a 50th anniversary symposium in the state Capitol auditorium will start at 9 a.m. and continue into the afternoon with speakers such as Don Hibbard, architectural historian, Robbie Dingeman, Honolulu magazine editor-at-large and Colin Moore, director of the Public Policy Center, UH Mānoa. Registration is required for this March 16 event. The Capitol was dedicated on March 15, 1969 on the 10th anniversary of the passage of the statehood bill by Congress. Governor John A. Burns used his opening address to the Legislature to describe the openness and spirit of Hawai‘i: “The open sea, the open sky, the open doorway, open arms and open hearts—these are the symbols of our Hawaiian heritage…It is by means of this striking architecture of this new structure that Hawai‘i cries out to the nations of the Pacific and of the world this message: `We are a free people…we are an open society…we welcome all visitors to our Island home.’” For more details and registration, go to https://historichawaii.org/2019/01/31/democracybydesignsymposium/.